Second Sundays #10 – Jasmine Guffond: Listening Back. The Web Never Forgets. 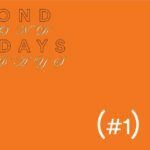 Second Sundays is a monthly series initiated by Q-O2. Each session a new guest is invited to share an insight into their own listening, playing and speaking about a selection of sound and music that is important to their thinking or practice. The sessions try to put value on listening to recorded music in a social setting as a space for discussion. The series takes place on the second Sunday of every month,. Each session is paired with a cocktail-of-the-month, as decided by the invited guest.